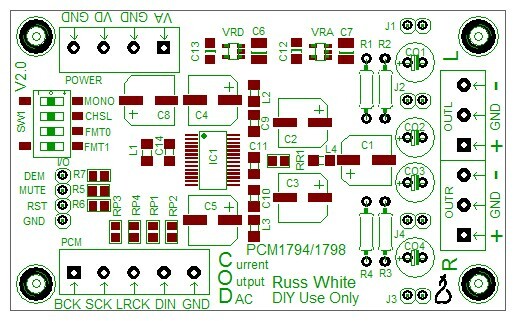 The COD Module is based on the venerable Burr-Brown (Texas Instruments) PCM1794A DAC chip, and is user-configurable with tri-state dip switches. Being a current output DAC (Opus is voltage ouput), this module requires an I/V (current to voltage) stage at it's output. We have included a simple on-board passive I/V stage (392R Dale RN55 resistor/22uF 35V Elna SilmikII capacitor), which can feed the buffer of your choice (we of course suggest the Ballsie for that role). 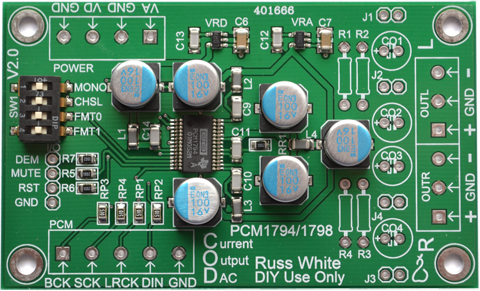 In case you want to use an active or other passive I/V stage, the resistors come un-mounted, and there are four on-board headers for bypassing the installed output capacitors. We have two active I/V stages in the works, both with balanced outputs. The first uses the Burr-Brown OPA1632 fully-differential op-amps, the other is a fully discrete balanced design.